Getting ready for MFW17 – create the future! “We are not predicting the future, we are creating it” wrote a participant in a tweet after the final presentation of the Media Future Week in 2012. It was this tweet that captured the essence of the Media Future Week for us. 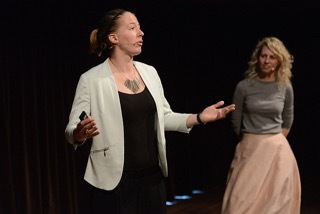 As the program team, (or co-creation coaches, energy masters, or whatever fancy name you can come up with) Manon and Willemijn develop a learning experience for the Media Future Week. With a full time program based on design principles and a co-creation process with creative research tools guided by 10 driven facilitators who have a taste for group dynamics and individual growth, we are excited to meet this year’s participants. The main purpose of the Media Future Week is to get our eyes on the future of media, and start creating it. Manon has been in de media workfield for more than ten years now, mostly in the field of making and prototyping. She gets enthusiastic when people ride the borders of paradigms and start creating totally new (mostly crazy) ideas about what could be and dare to fail on the way. Even though Manon is currently pregnant you could still feel her energetic (a heritage of her topsport-career) vibe through the week. Do you have a low battery during the week, go find Manon. Willemijn is an experienced organiser of large scale co-creation events and moderator who gets her kicks from people thriving and creating new concepts together. She creates the scenery and setting where people feel comfortable to get out their comfortzone. Never turns down a good high five. “It’s a privilege to work on this event with this team, both the organisation as the facilitators” she says. We personally get excited when we see teams and individuals step out of the prospected learning and experience curve and dare to challenge themselves to make the most of it (and more). Seven years ago we were asked to design a student congress-like event. And this is what we made of it because we believe in co-creation networking, creating, debating, making and more. We learn and experiment every year with new methods, processes and programs. And we love to do so. In a week from now the #MFW17 is ON! Imagine flying post-it’s, serious playgrounds, laughing people, inspiring (inter-) national keynote speakers, meet fast forward thinkers, colorful team spaces and a creative vibe. When you read this, you’re probably one them. If you are not: there are several opportunities to join the event. Visit keynote speakers for free in real life or watch the livestream. We highly recommend you to look at the readinglist on the website and to watch the Tegenlicht documentairy (partly Dutch) to get that brain muscle in shape for this years theme Design for Storytelling in a Post-truth Media World. The biggest challenge for you is to make yourself ready for a rollercoaster week. There is really no need to ever doubt yourself if you’re smart enough, if you can make a contribution. Yes you can, and the facilitators and us will reassure you of that. Over 600 alumni experienced it before and nobody got harmed 😉 If you’re open for advice, we’d share this with you; dare to ask questions, dare to be open and try something different then you are used to. If there’s a place to try something new, this is the right spot. Go with the flow, enjoy the highs as well as the lows, you can find meaning in both. We hope you find yourself at the end of the week filled with thrilling experiences, with an understanding of the latest media trends and feel a deep readiness to take yourself into this world and make it your own.